a Commercial Office Interior Design by Residenza Designs Thalore,Thrissur.This office space is designed by Bibin Balan. 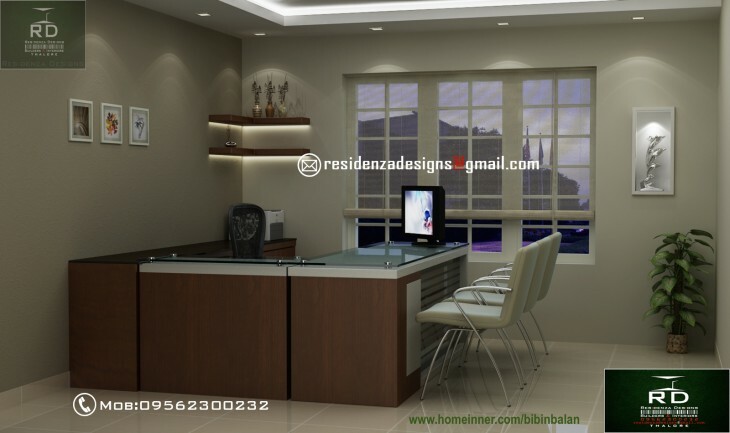 If you like this House design idea theme - "Commercial Office Interior Design by Residenza Designs" , do take few seconds to share with your friends and relatives . Let them know what you like. Then , use professionals like Licensed Architects or Engineers or home designers to prepare the Floor plan and other house design drawings . You may also use the traditional approaches like Vasthu consultants to prepare the floor plan . If you have the reference layout and room requirement ,3D elevations , Interior designs etc will help the Home designers to complete design in few days. Showcase your Projects at Free of cost.We showcase home designs,Interior designs,Exterior designs,Land for sale, home for sale at free of cost . Architects,Interior designers,Builders can use this opportunity at free of cost. All content on this website is the property of Homeinner or its authorized content suppliers and protected by Indian and international copyright laws. The content on this website may be used for viewing on this website, but title to the content shall not pass to any user. Any other use, including the reproduction, modification, distribution, transmission, republication, display, or performance, of the content on this site is strictly prohibited. For personal use only, provided that each such copy contains a copyright notice as follows: Copyright © Homeinner 2017. All Rights Reserved. Homeinner strictly follow Copyright ownership of designer, And if any of the published design is not owned by the Designer details provided on the design page,We request you to contact us immediately via support@Homeinner.com .We will review your request and Honour the genuine action required . All the designs are Emailed by the copy right owners or have the proof submitted for publication , if any one have copyright issue contact us via email support@Homeinner.com with all the details. Note : Homeinner.com and its content created and offered to Indian users only . All the Home designs,Free Home plans , structural designs ,Interior design ideas provided in the Homeinner blogs are for information purpose only. We don't take any responsibility for errors in the same. All the information has to be verified by a professional architects,Interior designer , civil Engineer,Structural consultant or Vasthu consultant before start using for construction or estimation. Homeinner is not undertaking any responsibility / liability for the information provided here, all the risk will be born by the users who wish to use the information provided at Homeinner blogs or websites.